Health research appears in the media almost every day, but it can be difficult to know which studies are good quality, and which ones are not. Only a small section of society, mainly clinicians and researchers, are taught how to critically appraise scientific health evidence. Now a new online tool called, Understanding Health Research, launched today, hopes to change that by helping people “ask the right questions” and “understand and evaluate” health research. 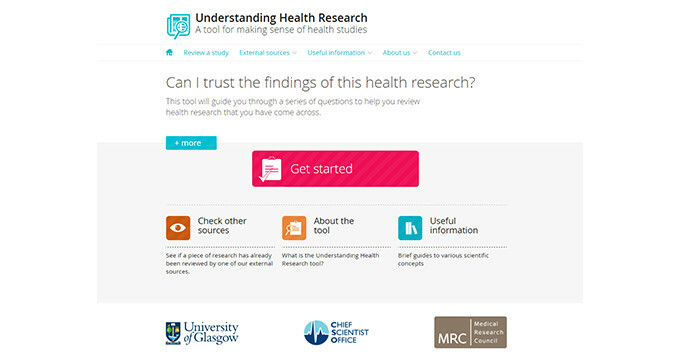 Created by the MRC/CSO Social and Public Health Sciences Unit (MRC/CSO SPHSU), University of Glasgow in collaboration with an advisory panel of academics, Understanding Health Research offers a free, interactive, online service designed to help people better understand complex health research and “go beyond the headlines”. The site guides users through the process of understanding health research, explaining and reinforcing key scientific concepts along the way. At the Science Council we recognise that scientists come from across various sectors and disciplines, and so we welcome this cross-sharing of information as the site will be useful for scientists who do not have a background in healthcare science.